The British-built Mars lander, Beagle 2, is on schedule to reach the Martian surface on Christmas Day. Mission officials say its parent space craft, Mars Express, has survived a massive solar storm and is within 20 million kilometres of the Red Planet. Beagle 2 is due to descend through the Martian atmosphere and touch down on 25 December. "Mars Express the satellite is on collision course with Mars," said John Reddy, principal of electrical systems. "It means Beagle 2 is going to get there by hook or by crook." Europe's first solo mission to Mars has been disrupted by the greatest solar storm on record but there have been no long-term effects. However, engineers still need to check that Beagle 2 has withstood this intense bombardment from the Sun. Radiation shields should protect its inner workings but engineers cannot be certain until the power supply is switched on in the next week or so. Beagle 2 mission manager Dr Mark Sims of the University of Leicester, UK, said the chances of any damage to Beagle 2 were low but not zero. "As the mission manager I will not be happy until we turn Beagle 2 on next week," he told a news conference at the Royal Society in London. The next hurdle for Beagle 2 comes on 19 December, when Mars Express will jettison the stowaway. It will send the lander twirling towards the planet on a precise trajectory. Beagle has no propulsion system of its own but will rely on the laws of physics to find its way to the planned landing site, a flattish basin in the low northern latitudes of Mars. Once Beagle 2 enters the Martian atmosphere, a heat shield will protect it as it is slowed by friction. Nearer to the ground, parachutes will deploy and large gas-filled bags will inflate to cushion the final touchdown. 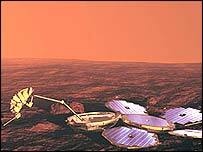 Beagle 2 should bounce to a halt on the rocky red soil of Mars in the early hours of Christmas morning. Project scientists keeping an overnight vigil then face an anxious wait to see if the probe has survived the landing. They will be hoping for a radio signal from Beagle 2, relayed through the US space agency's (Nasa) Mars Odyssey craft, something which could take hours or even days. Professor Colin Pillinger of the Open University in Milton Keynes said the first communication would contain a call signal written by the rock band Blur. "The first signal will be a stream of data which will be housekeeping on the lander headed by the Blur signature tune," he told BBC News Online. If nothing is received on Christmas morning, the Jodrell Bank Telescope will be called in during the evening to search for a faint radio signal from Beagle 2. The first day on Mars will be crucial for the lander. It has but a few hours of sunlight to recharge its battery using solar panels. Scientists are well aware of the risks of landing a craft on Mars. Some two-thirds of Mars missions have ended in failure, often during landing. "All the engineering tests, all the engineering analysis says it should work but if something goes wrong - we hit a wind shear during entry, we're just unlucky to hit a sharp rock on the first bounce - then maybe it's game over at that point," said Dr Sims. "We've tried to choose the landing site, tried to choose the engineering to make sure it's a success. But there are no guarantees in life." As a last resort, Mars Express can search for the probe but it will not be in place for such a task until early January. Engineers will fire the space craft's main engine in the early hours of 25 December to put it in orbit around Mars. 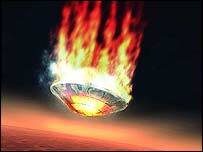 Further adjustments will then be carried out before the space craft is ready to start capturing images on 4 January. From then on, if all goes well, Beagle 2 and Mars Express will start their main science mission - searching for signs of water and past life on the planet.